Senior Charlee Borcky had no idea what she was in for as she and her Cardinal O’Hara volleyball teammates warmed up to host Philadelphia Catholic League and Delaware County rival Msgr. Bonner-Archbishop Prendergast on Tuesday, Oct. 11. The senior had tied her school record of 148 career aces in a victory over West Catholic on Sept. 29. Then on Tuesday, Oct. 4, she officially broke that record in a win over St. Hubert and was honored on the court prior to taking on Bonner-Prendie. Following her big surprise, Borcky continued her good work. She finished with 13 kills, five digs and two aces, extending her total career aces to 160 as the Lions dominated the Pandas, 3-0. They emerged with scores of 25-16, 25-10 and 25-12. 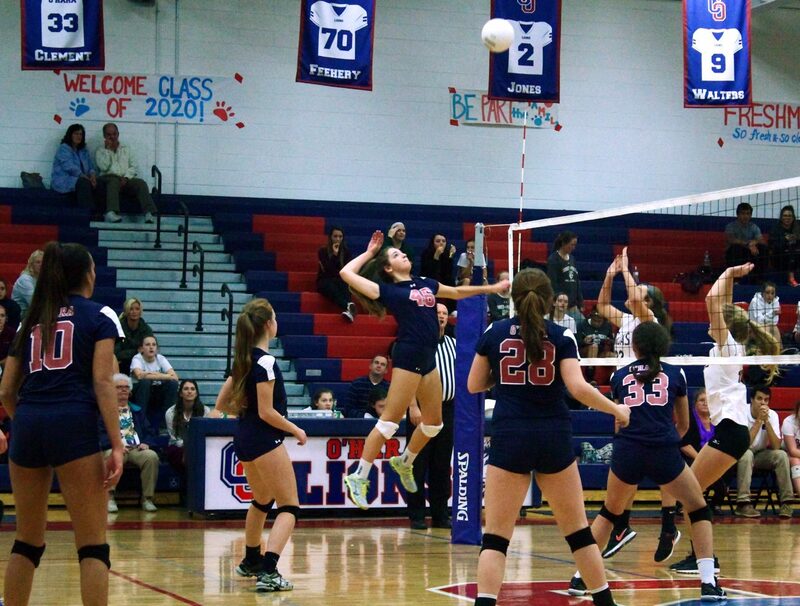 This outcome put the Lions in second place in the Catholic League with an overall record of 15-2. Another special moment in a special evening was the Vest-A-Cop charity event at O’Hara that raised $1,230 to purchase bulletproof vests for police officers that protect and serve local communities. In attendance were Collingdale Police Chief Bob Adams and Ridley Park Corporal Marc Hanly who was shot in the chest and leg in the line of duty on Aug. 30, 2015. On that day the bulletproof vest saved his life, according to police. The game began with Prendie taking the first lead. O’Hara used its first time out when it held an 8-7 advantage and that came in handy as the Lions remained on top for a while. While O’Hara was in the lead by a substantial margin for most of the second game, Prendie made it narrow in game 3. O’Hara was trailing by one point early in the set and took a time out. That was just what the Lions needed as they came roaring back into the game. They extended their surplus to 15-7, prompting Prendie to call a time out. The pause did not stop O’Hara which managed to get the shutout. Seniors Meghan MacWilliams (32 assists, three aces, three digs) and Erin Daly (seven kills, one ace, four digs) helped pave the way to victory. Junior Breanna Hickey added seven kills, two aces and eight digs. Seniors Caroline Goggin (eight digs, five kills), Molly Ryan (six digs, five kills), Maggie McPeak (eight assists) and Caroline Manfre (four blocks, two kills) as well as junior Madison Oxenberg (four blocks) led the way for Prendie.